Sweden’s warmastering metal tank Sabaton was most recently in the headlines concerning the band’s line-up going through an upheaval, 4 out of 6 members being switched. Their sixth studio album, Carolus Rex, was still fired into place by the old line-up and a damn fine job they have done, I must say. So good that hopefully the headlines will soon focus solely on this new record. The band’s love for war-drenched themes has remained very much intact, but this time around we have a unified, older theme going on. No D-Days or Finnish snipers to be found here. The theme flows from the band’s homeland of Sweden, with the latinized name Carolus Rex referring to Sweden’s one-time king Charles XII. I believe his era was considered the peak of the Swedish empire, and this 17th-to-18th century time period is where our camouflage-pantsed troupe of metalheads have planted their flags for this record. The record is actually being released in both Swedish and English, two different versions where I think even a limited double edition will be available. This review is done solely on the English promo but the “original tongue” version should be very intriguing, especially for the linguistic types like myself. I can’t see Joakim Brodén’s splendid voice or the massive gang shouts being any less majestic in either language, really. Musically we are looking at the most diverse Sabaton-album ever. I can see the band feeling that as great as their previous studio record Coat Of Arms was, it was pretty balls out through and through with like two mid tempo numbers in between. On Carolus Rex, we have the speedy headbangers such as The Lion From The North and 1648 with monster riffs and those unmistakably tasty Sabaton-synthesizers lacing the brain with delight. The Carolean’s Prayer starts off with some mighty church organs until going into a powerful, fist-pumping mid-tempo churn. Call it another nice rip-off of the Heaven-And-Hell-thumping-bass-line groove if you will, but man I can dig it. The title track may be the only track here that outright feels a bit mediocre, even with a killer chorus in between. Killing Ground is just pure galloping Maiden-worship that should get all the people longing for Piece Of Mind giddy. Long Live The King is an alright attempt at a ballad Sabaton-style, but it is certainly eclipsed in brilliant balladry by the gargantuan, string-driven A Lifetime Of War, which I feel has the kind of chorus simply destined to be sung with the masses at Wacken and all similar gatherings. One of the group's finest. Producer Peter Tägtgren (who also pulls off a nifty vocal duet with Joakim on Gott Mit Uns) has really squeezed everything out of the soundscape, which is really crisp and punchy, yet still breathes very well. The choirs sound absolutely beautiful, special note. Somehow that also feels an apt word for the metal contained within here: beautiful, while still personifying that enthusiastic, brutal power metal drive expected from Sabaton. If the rapid fire mayhem of Coat Of Arms was exactly to your liking, maybe some tunes here leave you wanting more, but I like the balance. 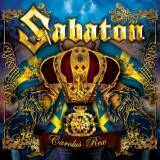 Best Sabaton album…Primo Victoria, The Art Of War, Coat Of Arms…or Carolus Rex? Tough to tell at this point but I’d rank this doozy right up there in the mix. Fans of melodic metal, do not hesitate to check this one out.